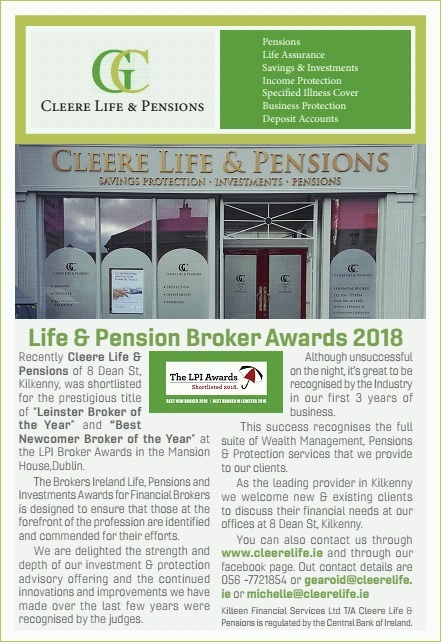 Cleere Life & Pensions of 8 Dean St, was shortlisted for the prestigious title of “Leinster Broker of the Year” and “Best Newcomer Broker of the Year” at the LPI Broker Awards in the Mansion House, Dublin. The Brokers Ireland Life, Pensions and Investments Awards for Financial Brokers is designed to ensure that those at the forefront of the profession are identified and commended for their efforts. We are delighted the strength and depth of our investment & protection advisory offering and the continued innovations and improvements we have made over the last few years were recognised by the judges. Although unsuccessful on the night, it’s great to be recognised by the Industry in our first 3 years of business. This success recognises the full suite of Wealth Management, Pensions & Protection services that we provide to our clients. As the leading provider in Kilkenny we welcome new & existing clients to discuss their financial needs at our offices at 8 Dean St, Kilkenny. Killeen Financial Services Ltd T/A Cleere Life & Pensions is regulated by the Central Bank of Ireland.